A Middle School Survival Guide: bulletin board inspiration. 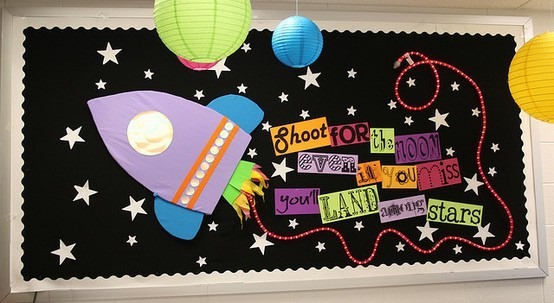 Want some back-to-school decorating inspiration? Head on over to the first grade parade for some fantastic themed bulletin boards/hall themes. These ideas really put mine to shame. Her idea for the space bulletin board came from over here at teach factory....and I am in love with this version and all the beautiful classroom setups on this page! WOW. Best. Bulletin. Boards. Ever. ...and EVEN better, she shared a pdf of the fonts for the board. Score! Could I get away with this adorably themed bulletin board up in big bad ol' middle school? I think so. It's official. I'm making it my goal to make this happen. It will be perfect for adding in a sciencey theme without all that boring informational poster stuff (who ever looks at them anyway? ).